Dividends are an important part of return, as demonstrated by these two performance charts. 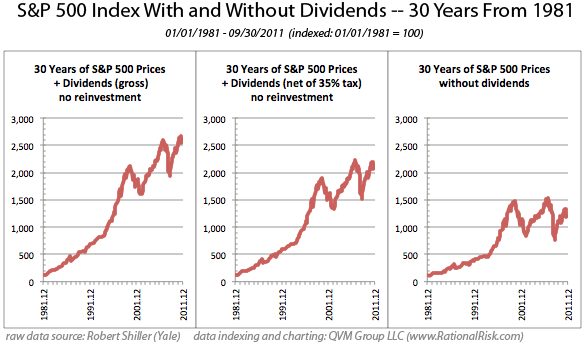 The compounding effect of dividends increases in magnitude over time, as also shown in this set of 30-year charts of the index price, index dividends and the two combined. This entry was posted on Thursday, April 5th, 2012 at 10:22 AM and is filed under Interesting Charts. You can follow any responses to this entry through the RSS 2.0 feed. Both comments and pings are currently closed.